Lorri Brown of the Healthy Community Coalition speaks about HCC’s various health promotion efforts at a recent Rotary Club meeting. 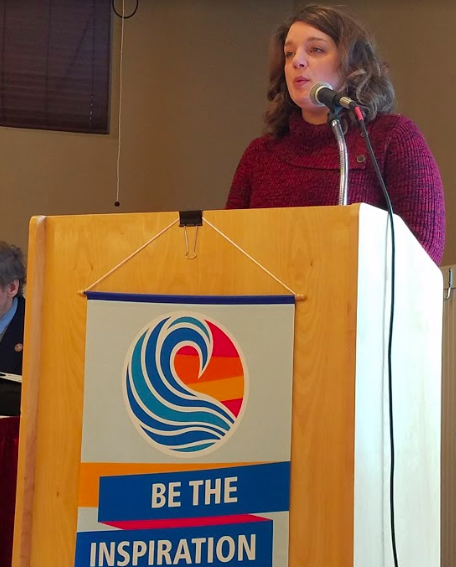 FARMINGTON - Lorri Brown, Program Director at the Healthy Community Coalition (HCC) spoke with the Farmington Rotary Club January 17. HCC is celebrating 30 years of serving the Greater Franklin region. HCC’s mission is to improve the health and well-being of our families, neighbors, and the communities where we live and work. HCC uses a coordinated public health approach of education, promotion, and outreach. Staff of public health professionals offer health screenings, health information, and programs and events to support healthy lifestyles that prevent disease and improve quality of life. HCC is most known for its 34-foot Mobile Health Unit. Staff provide various health screenings in all corners of the county. 1,900 people were seen in 2018. 80% were un or underinsured. In addition to blood pressure checks and tobacco cessation offered on the mobile health unit, HCC promotes colo-rectal cancer screening. Significant promotion has led to the highest screening rate in the nation increasing from 69 percent to 86 percent. An important milestone given the high rates of colon cancer in Franklin County.